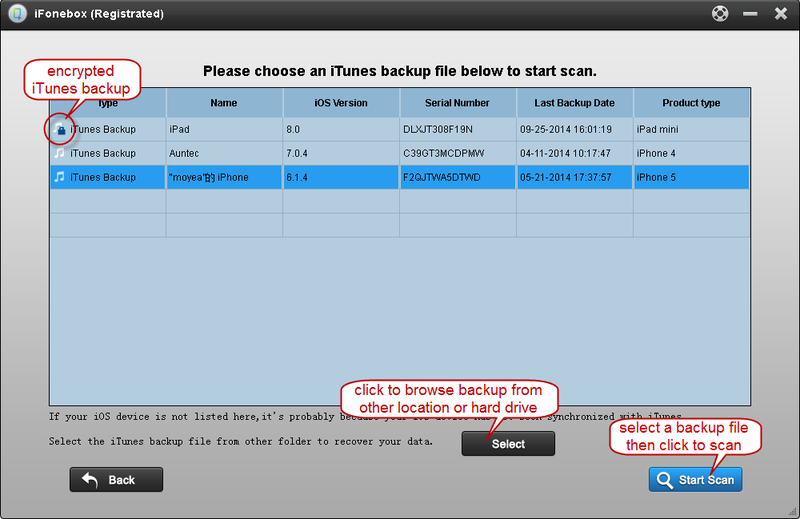 Nowadays, a number of iPhone user choose to encrypt their backup file when sync with iTunes to protect personal privacy. Then when you accident deleted some important data on your iPhone, is there a quick way to extract and recover data from encrypted backup? If you know the password, iFonebox– iTunes encrypted Backup Extractor must be the best choice to access and extract data from encrypted iTunes backup. 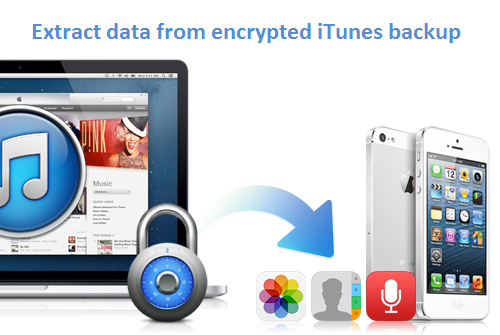 iFonebox will decrypt the encrypted iTunes backup and extract valuable data (e.g. 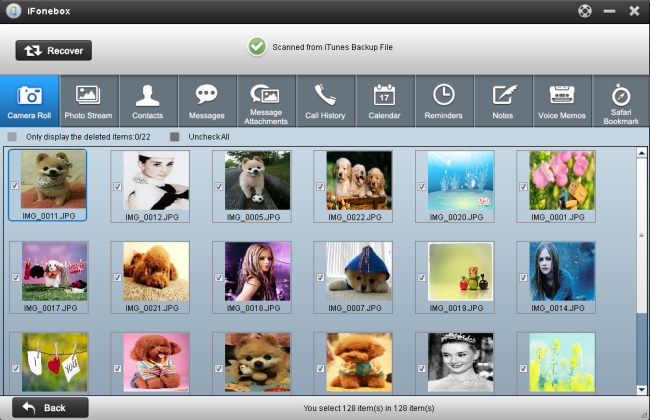 Photos, Videos, SMS messages, Contacts, Calendar events, Recordings, Notes, Call historys and other data). 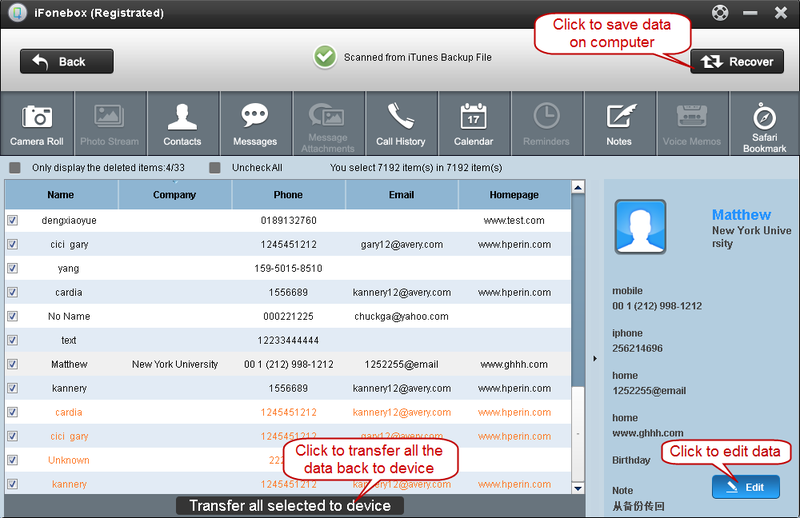 Unlike other data recovery programs(that can only export data from backup to computer), the current version of iFonebox supports transfer contacts and notes from encrypted and non-encrypted iTunes backup back to your iPhone. (it will add photo,app and other data transfer in future update). Warning: If you encrypt an iPhone/ iPod/ iPad backup in iTunes and then forget your password, you will not be able to access the backup restore data with iFonebox, and your data will be unrecoverable. Make sure it’s a password you will remember or write it down for safekeeping. The software will automatically load the backups from your ‘default backup folder’ from the most recent to the oldest one. Otherwise, you can click “Select” button to browse backup from other locations or external hard drive. Step 3 When scanning finished, all files in encrypted iTunes backup are extracted and displayed here, You are able to preview the contents of all files. 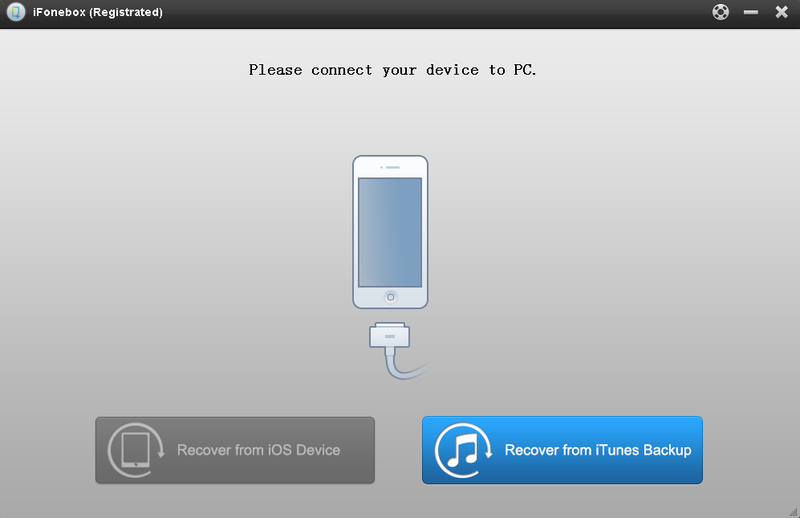 Then choose what you want and click “Recover” to save them all on your computer or directly transfer Contacts/notes back to your iPhone/iPad. 1. Open the iTunes application on your computer. 2. Connect your device to the computer via USB. 4. 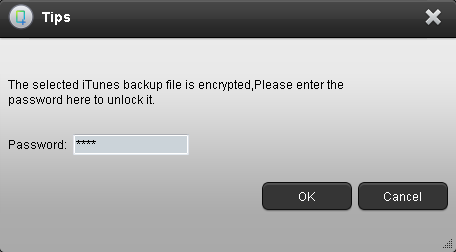 Under the Summary tab -> Options -> check the box Encrypt local backup. 5. You will be prompted for a password, enter it twice. 7. Backups will be encrypted from now on when you sync your iPhone/iPad/iPod with this computer. iMessage on iOS 8 Having Problems? How to fix? This entry was posted in iTunes, Transfer and tagged access encrypted iTunes Backup, export photos from encrypted iTunes Backup, extract data from encrypted backup, Transfer contacts from backup to iPhone by IosdroneD. Bookmark the permalink.